Carlos Brathwaite struck four straight sixes to overhaul England's 155 to seal a dramatic four-wicket win. West Indies' players rushed on to the ground to celebrate and then broke into an impromptu jig after becoming the first team to win the World Twenty20 title on two occasions, after success in 2012. "It's something we'll cherish for a long time," West Indian captain Darren Sammy said. "Every game somebody stepped up. It was good to see Carlos play like that in his debut World Cup. It shows the T20 depth we have in the Caribbean." It was a double delight for West Indies fans as their women's team pulled off a surprise eight-wicket victory over Australia in the final played earlier. Samuels added 75 runs off 69 balls for the fourth wicket with Dwayne Bravo (25) who also put up an allround effort having taken 3-37. For 2010 champion England, Joe Root produced an allround performance of 54 and 2-9, after being brought on to bowl at the beginning of the Windies' innings. 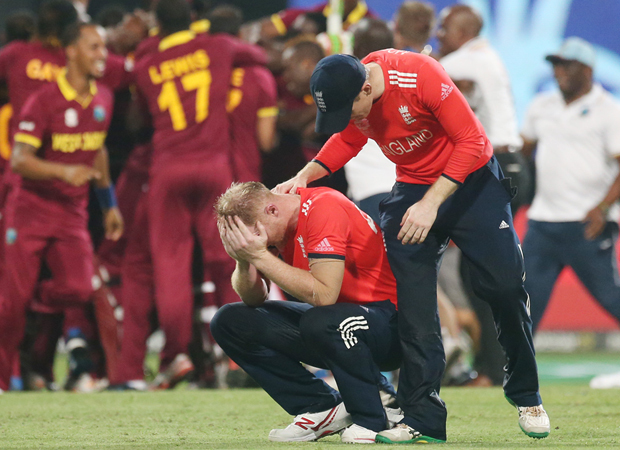 "We were certainly in the game, put ourselves in a position to win the game," England captain Eoin Morgan said. "We didn't have enough runs on the board, it was a really good batting surface, maybe 180-90 would have been good." Root grabbed two wickets in the space of three deliveries as he dismissed both openers in the second over of the innings. Johnson Charles (1) was caught at mid-off and Chris Gayle (4) holed out to long-off as the move to use Root's part-time off spin with the new ball paid off. England were reduced to 23-3 with Andre Russell dismissing opener Alex Hales (1). Buttler's dismissal led to another slump as Brathwaite and Bravo proved effective in the latter half of the innings. Goodness Gracious Me! That was an incredible game of Cricket. Well done Captain @darrensammy88 and @westindies Cricket. That impossible sporting dream you have as a kid - Carlos Brathwaite just lived it. Unreal.